Zalesskiy S. S., Sedykh A. E., Kashin A. S., Ananikov V. P., J. Am. Chem. Soc., 2013, 135, 3550-3559. Soluble gold precatalysts, aimed for homogeneous catalysis, under certain conditions may form nanoparticles, which dramatically change the mechanism and initiate different chemistry. The present study addresses the question of designing gold catalysts, taking into account possible interconversions and contamination at the homogeneous/heterogeneous system's interface. It was revealed that accurate localization of boundary experimental conditions for formation of molecular gold complexes in solution versus nucleation and growth of gold particles opens new opportunities for well-known gold chemistry. Within the developed concept, a series of practical procedures was created for efficient synthesis of soluble gold complexes with various phosphine ligands (R3P)AuCl (90–99% yield) and for preparation of different types of gold materials. The effect of the ligand on the particles growth in solution has been observed and characterized with high-resolution field-emission scanning electron microscopy (FE-SEM) study. Two unique types of nanostructured gold materials were prepared: hierarchical agglomerates and gold mirror composed of ultrafine smoothly shaped particles. Kashin A.S., Ananikov V. P., J. Org. Chem., 2013, 78, 11117-11125. In situ generated catalysts and preformed catalysts are two practical strategies widely used in cross-coupling methodology that have long been considered to involve the same active species in the catalytic cycle. Recent mechanistic studies have revealed two fundamentally different pictures of catalytic reactions in solution. Preformed catalysts with strongly bound ligands initiate transformations mainly involving single type of metal species. In contrast, in situ generated catalysts give rise to cocktail-type systems with different metal species presented in solution. 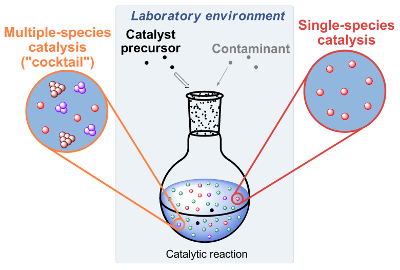 The role of catalyst precursor, interconversions of catalytic species during reaction, stability and recycling of catalyst, catalysis by autocatalyst exhaust and plausible sources of metal-containing contaminants are the key points discussed in this review. Romashov L.V., Ananikov V.P., Chem. Eur. J., 2013, 19, 17640-17660. Self-assembled monolayers (SAMs) of selenium have emerged into a rapidly developing field of nanotechnology with several promising opportunities in materials chemistry and catalysis. Comparison between sulfur-based self-assembled monolayers and newly developed selenium-based monolayers reveal outstanding complimentary features on surface chemistry and highlighted the key role of the headgroup element. Diverse structural properties and reactivity of organosulfur and organoselenium groups on the surface provide flexible frameworks to create new generations of materials and adaptive catalysts with unprecedented selectivity. Important practical utility of adaptive catalytic systems deals with development of sustainable technologies and industrial processes based on natural resources. Independent development of nanotechnology, materials science and catalysis has led to the discovery of common fundamental principles of the surface chemistry of chalcogen compounds. Toukach F. V., Ananikov V. P., Chem. Soc. Rev., 2013, 42, 8376-8415. All living systems are comprised of four fundamental classes of macromolecules – nucleic acids, proteins, lipids, and carbohydrates (glycans). Glycans play a unique role of joining three principal hierarchical levels of the living world: (1) the molecular level (pathogenic agents and vaccine recognition by the immune system, metabolic pathways involving saccharides that provide cells with energy, and energy accumulation via photosynthesis); (2) the nanoscale level (cell membrane mechanics, structural support of biomolecules, and the glycosylation of macromolecules); (3) the microscale and macroscale levels (polymeric materials, such as cellulose, starch, glycogen, and biomass). NMR spectroscopy is the most powerful research approach for getting insight into the solution structure and function of carbohydrates at all hierarchical levels, from monosaccharides to oligo- and polysaccharides. Recent progress in computational procedures has opened up novel opportunities to reveal the structural information available in the NMR spectra of saccharides and to advance our understanding of the corresponding biochemical processes. The ability to predict the molecular geometry and NMR parameters is crucial for the elucidation of carbohydrate structures. In the present paper, we review the major NMR spectrum simulation techniques with regard to chemical shifts, coupling constants, relaxation rates and nuclear Overhauser effect prediction applied to the three levels of glycomics. Outstanding development in the related fields of genomics and proteomics has clearly shown that it is the advancement of research tools (automated spectrum analysis, structure elucidation, synthesis, sequencing and amplification) that drives the large challenges in modern science. Combining NMR spectroscopy and the computational analysis of structural information encoded in the NMR spectra reveals a way to the automated elucidation of the structure of carbohydrates. Gordeev E. G., Polynski M. V., Ananikov V. P., Phys. Chem. Chem. Phys., 2013, 15, 18815-18821. Understanding molecular interactions of graphene is a question of key importance to design new materials and catalytic systems for practical usage. Although for small models good accuracy was demonstrated in theoretical analysis with ab initio and density functional methods, the application to real-size systems with thousands of atoms is currently hardly possible on routine bases due to the high computational cost. In the present study we report that incorporation of dispersion correction led to the principal improvement in the description of graphene systems at a semi-empirical level. The accuracy and the scope of the calculations were explored for a wide range of molecules adsorbed on graphene surfaces (H2, N2, CO, CO2, NH3, CH4, H2O, benzene, naphthalene, coronene, ovalene and cyclohexane). 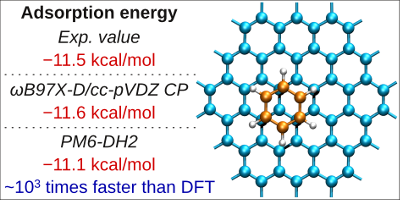 As a challenging parameter, the calculated adsorption energy of aromatic hydrocarbons on graphene Eads = −1.8 ± 0.1 kcal mol−1 (per one carbon atom) at the PM6-DH2 level was in excellent agreement with the experimentally determined value of Eads = −1.7 ± 0.3 kcal mol−1. The dispersion corrected semi-empirical method was found to be a remarkable computational tool suitable for everyday laboratory studies of real-size graphene systems. Significant performance improvement (ca. 103 times faster) and excellent accuracy were found as compared to the ωB97X-D density functional calculations. Khemchyan L. L., Khokhlova E. A., Seitkalieva M. M., Ananikov V. P., ChemistryOpen, 2013, 2, 208-214. An easy and convenient procedure is described for monitoring chemical reactions and characterization of compounds dissolved in ionic liquids using the well-known tandem mass spectrometry (MS/MS) technique. Generation of wastes was avoided by utilizing an easy procedure for analysis of ionic liquid systems without preliminary isolation and purification. The described procedure also decreased the risk of plausible contamination and damage of the ESI-MS hardware and increased sensitivity and accuracy of the measurements. 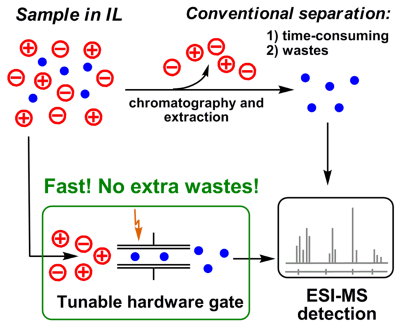 ESI-MS detection in MS/MS mode was shown to be efficient in ionic liquids systems for structural and mechanistic studies, which are rather difficult otherwise. The developed ESI-MS/MS approach was applied to study samples corresponding to peptide systems in ionic liquids and to platform chemical directed biomass conversion in ionic liquids. Kashin A. S., Ananikov V. P., Top. Catal., 2013, 56, 1246-1252. A new approach for the catalytic carbon–sulfur bond formation via cross-coupling reaction is reported. For the first time nano-structured nickel organosulfides [Ni(SAr)2]n were used as a source of SAr groups in catalytic cross-coupling reaction. A unique effect of morphology control of the reactivity of SAr groups in cross-coupling reaction was found. Synthesized nano-structured particles were characterized by field-emission scanning electron microscopy and their reactivity was studied by NMR in solution. Cross-coupling reaction with Cu catalyst was shown to proceed in the liquid phase and involve leaching, whereas the reaction with Pd catalyst is more complex and may involve both—homogeneous and heterogeneous pathways. Chistyakov I.V., Ananikov V. P., Mendeleev Commun., 2013, 23, 337-339. High selectivity and good yields in the catalytic addition of thiols and selenols to alkynes were observed for Ni and Pd chalcogenide catalyst particles with high degree of ordering, whereas direct correlation with size and shape of the particles was not identified. Ananikov V.P., Beletskaya I. P., Top. Organomet. Chem, 2013, 43, 1-20. In this chapter we review mechanistic concepts of carbon–heteroatom bond formation involving hydrofunctionalization of double and triple carbon–carbon bonds via migratory insertion pathway. A variety of useful synthetic procedures were developed within the scope of hydrofunctionalization reaction involving transition metal catalysts to change the direction of the addition reaction and to improve the selectivity of the process. Outstanding potential of multiple bonds activation and insertion in the metal complexes is far from being fully explored. 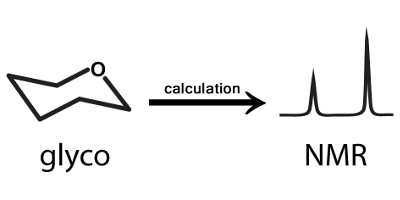 The key factors determining insertion pathways into metal–heteroatom vs. metal–hydrogen bonds and the influence on regioselectivity of the insertion remain to be revealed in nearest future. Kachala V.V., Khemchyan L.L., Kashin A.S., Orlov N.V., Grachev A.A., Zalesskiy S.S., Ananikov V.P., Russ. Chem. Rev., 2013, 82, 648-685. In the present review we describe the emerging tendency for creating target-oriented analytical approaches designed to solve important chemical tasks by using a combination of analytical tools. The concept is illustrated by selected examples of advances of NMR spectroscopy, mass spectrometry and electron microscopy in the analysis and study of gas-phase, liquid-state and solid-state chemical systems. Comparative description of chemical applications of these analytical methods is presented and discussed. The bibliography includes 359 references.